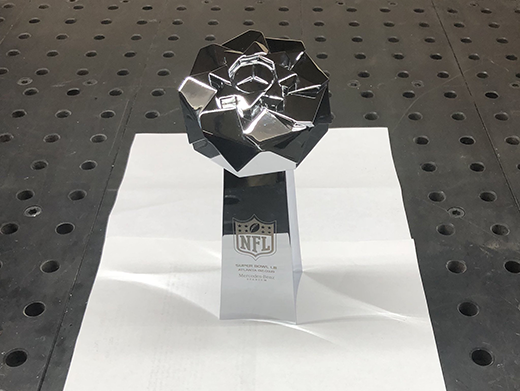 Southland CNC in Cornelia, a contract machine shop that mainly serves the aerospace industry, branched out into the red zone to create miniature trophies for suite guests at Super Bowl LIII (53) last February in Atlanta. The project came about when Sara Weinberger, creative designer and consultant for Arthur Blank’s (Atlanta Falcons and Atlanta United owner) personal suite at Mercedes Benz Stadium, was looking to create souvenir trophies for the gift baskets for suite guests at the big game. The trophies resemble the famous Vince Lombardi trophy, except the top is the Mercedes Benz Stadium. Process Floor Manager Brett Armour said they made about 150 of these trophies. Brett Armour said they chose to make the trophies out of aluminum bar stock since it was easy to work with. Brett Armour said they used a HAAS UNC 750 5-axis mill to get the top part (stadium piece) done. A 2R-NC mill was used to machine the trophy base. With OneCNC Software used for programming, the trophies were ready to go after assembling both completed pieces. 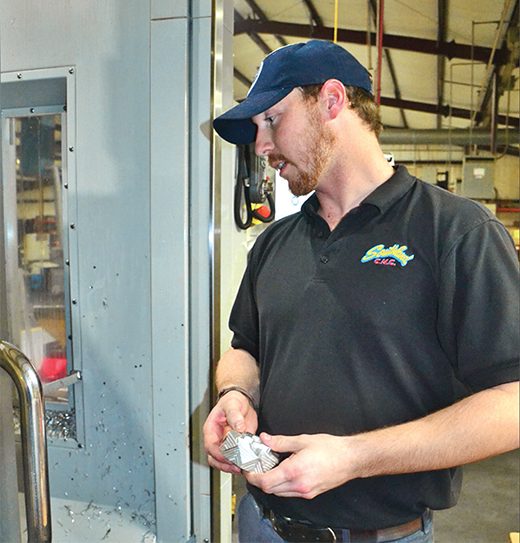 “Being able to use this machine (HAAS UNC 750 5-axis mill) and get to those sides without having to hold (reposition) it over and over is the only reason why we were able to do it,” Brett Armour said. Southland CNC Owner Regina Armour said the engraving was done by Piedmont Metal Processing in Demorest and the chrome plating was done by Dan’s Polishing Shop in Adamsville, Tennessee. The business was established in 1990 and is owned by Brett Armour’s parents, Keith and Regina Armour. Shown is one of the trophies carefully crafted for Super Bowl 53, which the city of Atlanta hosted Feb. 3 in Mercedes Benz Stadium. Shown is Brett Armour with the HAAS UNC 750 5-axis mill that was used to create the top portion of the souvenir trophies for suite guests at Super Bowl LIII in February at Mercedes Benz Stadium in Atlanta.